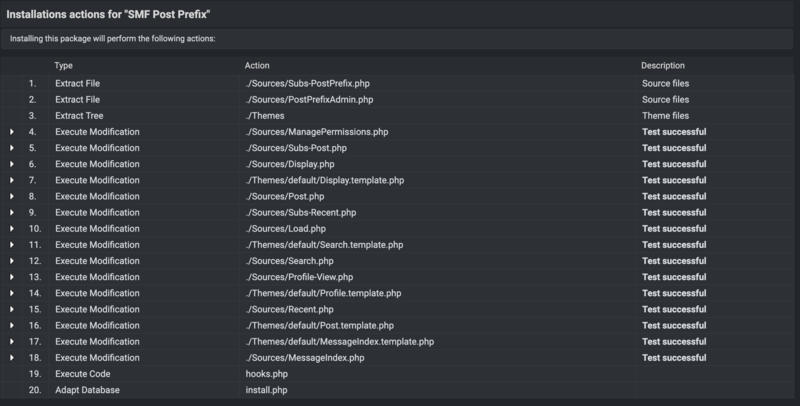 I am running SMF 2.0.15 and the Darkec theme. I installed the SMF Post Prefix mod version 2.1.1 available from the SMF mod site, but it does not work. The link to edit and configure the mod does not appear in the admin menu and I get errors when I try to uninstall the mod. Can you leave some more details? For instance, how are you getting errors in uninstall if you didn’t get any during the installation, doesn’t make any sense. Additionally, the mod is using hooks so if it’s not displaying the admin section there might be a chance your hosting didn’t execute this file for some reason so you’d have to do it manually. For uninstallation, I would get "Test Failed" for all of those options above. I know, it doesn't make sense, and what else doesn't make sense is I tried reinstalling it this morning and it works perfectly.